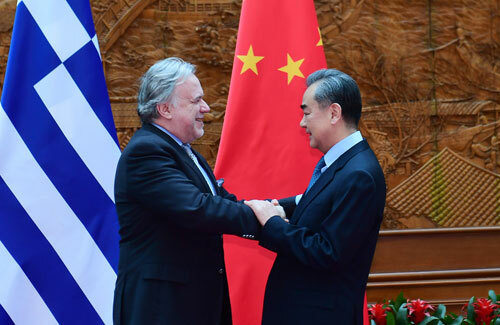 Wang Yi congratulated George Katrougalos on assuming his new post, and expressed that Mr. Foreign Minister chose China as the first country to visit after taking office, which demonstrated with concrete actions his friendship with China and the importance he attached to China-Greece relations. China and Greece are good friends and good partners who always enjoy mutual understanding and mutual trust on issues of each other's concern. As a birthplace of Mediterranean civilizations, Greece possesses profound cultural heritage and enormous development potential. The Chinese side feels happy that Greece has overcome the influence brought by financial crisis and regained economic and social vitality, and is willing to, together with the Greek side, strengthen high-level exchanges, increase understanding and mutual trust, expand bilateral cooperation fields under the framework of the Belt and Road Initiative, and build even closer bilateral relations during the process of joint construction, so as to achieve mutual benefit and win-win results. 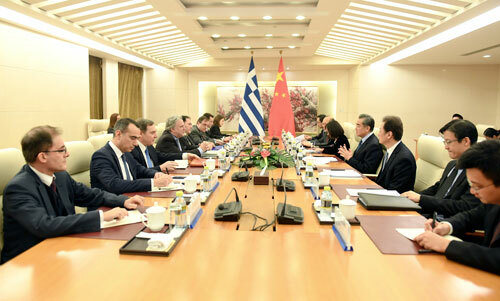 The Chinese side also stands ready to work with the Greek side to deepen people-to-people and cultural exchanges and cooperation, and enhance communication and coordination in multilateral affairs, in a bid to push China-Greece comprehensive strategic partnership to new stages.